Yes, Joe Jackson gets a lot of Shoeless Joe comments. "All the time. All the time. Especially road games," the 21-year-old catcher says before a recent morning workout at the Rangers' spring training camp in Arizona. "Everyone kids around about it. Even umpires kid around about it. Sometimes I tell them about it, and sometimes I don't. It depends. It's something I don't talk about that much. If they really want to know about it, I'll tell them." By "it," Jackson means that he not only carries the same name as the great -- but infamous -- hitter, he also is directly related to him. The Rangers minor league catching prospect is the great-great-great-nephew of Shoeless Joe and the first person in his family to play the game professionally since his great-great-great-uncle was banned from the game nearly a century ago. "I've played baseball from a young age, and that's when I started learning about [Shoeless Joe]. But it didn't really hit me how unique it is until I got to high school," Jackson says. "It's one of those things that was part of the family. And he died so long ago  that it's not like I knew him. My granddad used to talk about him a little bit. He remembered him. Once the older family members started passing away, it got a little more quiet around the family." Shoeless Joe was the most famous of the Black Sox, the players on the Chicago White Sox who conspired with gamblers to throw the 1919 World Series. The story has been told in nonfiction histories ("Eight Men Out," later a movie), novels ("Shoeless Joe") and film ("Field of Dreams" and "Eight Men Out"). Just what role -- and how much of one -- Jackson played in the gambling fix is subject to debate, but it cost him the remainder of his career as well as a spot in the Hall of Fame. Were it not for the scandal, Shoeless Joe would have a plaque on the wall in Cooperstown. Instead, he is enshrined on less famous walls. "We have a few plaques in our house that have his career stats on them," the younger Joe Jackson said. "I know a lot about his stats." It hardly seems fair that a lifetime ban would carry on decades after a player's death, but that's the case with Shoeless Joe. It's a harsh punishment considering that other players of that era, such as Tris Speaker, were implicated in betting scandals back when gambling was not an insignificant part of baseball. And considering that Charles Comiskey, the owner who took financial advantage of those White Sox and also helped perpetuate the color barrier, is in the Hall of Fame. Talk about scandals. "I think those guys were just in the wrong place at the wrong time," Jackson says of the banned White Sox. "I'm sure some of the guys did it, and I'm sure a few of the guys didn't do it -- they were just thrown into the mix. Unfortunately, Joe got an example made out of him. And it's still sticking to him to this day." Jackson says his family doesn't talk much about getting their ancestor into the Hall of Fame. "If people want to push for it, great. And if they want our help, we'll be there to provide information for them and help them out," he says. "But as a family, we don't really push for it. "Joe told the family he didn't do it, and that's good enough for us." Although Shoeless Joe and the White Sox lost the 1919 World Series, it's often forgotten that they won the 1917 World Series, the last series won by a Chicago team until the Sox swept the Astros in 2005. The Jackson family has a powerful reminder of that 1917 championship: Shoeless Joe's World Series ring. "He didn't have any kids on that side of the family, so it came straight down through my side of the family," Jackson says. "My granddad got the ring, then my dad, and I'll be next. It's almost 100 years old now, too." Drafted in the fifth round out of the Citadel last summer, Jackson hit .215 for Class A Spokane in the Northwest League. He wore that 1917 ring when he signed with the Rangers -- "That was awesome" -- and, naturally, would like to wear his own World Series ring someday. He will start this season at extended spring training, according to the Rangers. "I want to make it to the big leagues, obviously, and I want to make it for myself," he says. "It would be a great accomplishment for me. And I'd like to restore the family name a little bit, too. He didn't exactly go out of baseball on his best terms. The combination of both of those things is what drives me." Here's hoping he achieves his dreams and that we can say it is so: that a Joe Jackson is once again playing alongside major leaguers on a baseball diamond that doesn't have to be entered through a cornfield. With spring training drawing to a close this week, here's a card that shows a quintessential spring scene. 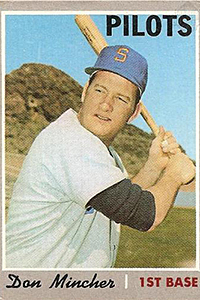 This is Don Mincher (1970 Topps, No. 185) at Tempe Diablo Stadium, where the Seattle Pilots trained in 1969 and 1970, and where the Los Angeles Angels now train. With the Oakland Athletics leaving Phoenix Municipal Stadium after this spring, we will lose one more old spring home. Phoenix Muni is old enough that it once served as a civil defense shelter. Longtime Oakland equipment manager Steve Vucinich recalls not only the civil defense signs in the clubhouse but also finding civil defense rations behind a locker. Now we're losing it and its picturesque, nostalgic feel. That leaves Tempe Diablo and its view of the neighboring butte as one of the last of the old spring sites. Something Is Always Better Than Nothing. Best wishes for a swift recovery by Aroldis Chapman from last week's awful line drive to the face. While a cap liner would not have covered the area of the face where the line drive struck Chapman, the incident is another painful warning that we need to help protect pitchers as much as possible. Liners won't prevent every injury, but they will stop some. Pitchers may feel that they are uncomfortable or are unmanly to wear, but that shouldn't matter. Decades ago, hitters didn't want to wear batting helmets for the same reason, but in time, they grew used to them and now wouldn't consider stepping to the plate without them. Let's get the liners on the mound as soon as possible while continuing to develop better protection. Heck, I Bet Even Zack Greinke Would Have Enjoyed The Trip. Last weekend's season-opening series between the Los Angeles Dodgers and Arizona Diamondbacks was immensely popular in Australia, drawing sellout crowds to the Sydney Cricket Ground despite the fact that ticket prices were comparable to those for World Series games. Seats behind home plate ranged from about $250 Australian (upper deck) to $500 (lower deck). A seat in the outfield, at least 450 feet from home plate and behind a party area AND with the view so obstructed by the top of the fence that you could barely see the game, went for $89. A concession stand offering $40 hot dogs sold out. (The Australian dollar is roughly equivalent to the U.S. dollar.) The most popular concession item, however, might have been the nachos. Not available at stadiums during Australian sporting events, the nachos stand had fans lined up like they were waiting for a Derek Jeter bobblehead. A friend and I also saw fans wearing caps and jerseys of every major league team, including the Tampa Bay Rays. Yes, there are Rays fans somewhere. The big clues are the name Jackson, both in the box score fragment and in the column about Shoeless Joe and his great-great-great-nephew. This fragment is from the last game Jackson and the Black Sox played. It's often assumed their final game was in that 1919 World Series, but they played the entire 1920 season before new commissioner Kenesaw Mountain Landis banned them despite their dubious courtroom acquittal. Jackson, by the way, hit .382 in that final season and finished with a .356 career batting average.